After seeing Meghan’s amazing painted turquoise floor last week, I was determined to paint the floor in my new porch too. Now of course, after doing this post, I’m convinced the ceiling needs to be painted too. Maybe in EVERY room! Ha! As you can see from above, it’s not just for front porches anymore. (Do you know why the paint of choice for many porches across the country is blue? Read about it here.) No matter the room, I adore the way it looks. So now I need to know…have any of you kicked it up a notch and painted your ceiling something other than white?? Blue perhaps?? 😉 Have a great weekend everyone! No, haven't painted my ceilings blue but after seeing these gorgeous images, may have to! It really doesn't matter whether your interiors are relaxed or more elegant, blue ceilings seem to work anywhere. Thanks for sharing these. I can't even tell you how happy my blue ceilings make me. That domino shot is like my den. I don't remember the wall paint color but it's similar to shaker beige. My bedroom has the same blue ceiling with a darker shade of the brown/beige on the walls, and our guest room has the blue ceiling with butter-yellow walls. Everyone who visits us loves the ceilings. Yep, I painted my living room ceiling blue. The walls, trim, and beams are White Dove and the ceiling is Polar Ice (both Ben Moore). I love it! It's very subtle and effective. My parents have painted their ceilings before although not blue- I think it can add a very dramatic setting to an otherwise mellow room (in this case a libary). I liked the information from the link you provided and am happy to have learnt about Haint Blue- and it's ghostly connections. For me, this post is timely. I've chosen a blue/turquoise for the ceiling color of my soon to be completed (addition) breakfast room with pale creamy white on the walls (the three walls that are not the brick of the original house). These photos help me dream about it more while we are finishing construction and confirm how beautiful it will be. Thank you, Erin. We have one at perch. the shop I work in, and of course every porch (including mine) in New Orleans has a blue ceiling. I think Martha Stewart copied me. In my last house my Master bedroom was painted almost in those exact colors. Deep olive green on the walls with a beautiful Blue ceiling. I would definitely paint my ceilings blue again. Just feels like the sky is up above. the first photo is seriously a dream kitchen of mine, i loooove it! Just last weekend my husband I and I painted our living room celing a very pale blue. We have Autumn Wheat walls and crisp white crown molding. The pale blue ceiling really pops and is just gorgeous! A wonderful contrast with the crown molding. We have received so many complimets on the blue ceiling. Thaks for sharing your post today! Great post. Every room so different. Some serious eye candy here! Have a great weekend. So gorgeous….boy are my wheels turning now! Love this post! I've been thinking of painting the master bedroom in gray with blue ceilings. This just confirmed that it's what I should do. Gorgeous! Wow. What inspiring images. Thank you!! Oh my gosh, how funny that you painted your porch floor turquoise after last week's post! I painted mine aqua a couple months ago, and can't wait to send you a pic, but the rest of the porch needs some work before it's camera worthy! 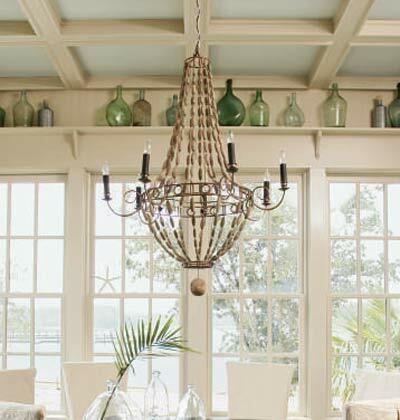 Also, love this one, because now i'm thinking of doing my master bath with aqua ceiling! thanks so much for all the pretty pics and inspiration i always get from your posts! Hi There! I'm a newish google subscriber! I too am in love with turqouise. NEVER thought to paint my ceilings….now I've got visions of light blue ceilings and crisp white board and batten walls. Oy, paint store here we come! SO beautiful! I love how breezy it makes everything look. Something to keep in mind next time we paint! Thank you so much Erin, I'm very inspired. I always associate blue ceilings with a baby's nursery, with hand painted fluffy white clouds. Just kid stuff. But these images are definitely all grown up. They look crisp and soft all at the same time. The backsplash on the first photo is out of this world. Love it!!! absolutely gorgeous, every one of them. I painted a ceiling blue in an earlier house, to great effect. I read somewhere that beyond aesthetics, blue ceilings have an added advantage – they repel insects (I read this somewhere so don't bink me if it's bunkum okay? 🙂 – anyway, supposedly, blue ceilings mimic the sky, which is where predators lurk, so insects tend to congregate less in places where ceilings are blue. Who knows? But when our reno is done I plan to paint our porch ceilings a light sky blue. What a pretty and unique idea! It's like have a beautiful blue sky inside your house. I love it! That was the best compilation I've ever seen on turquoise. Apparently I am all about the blue ceiling. Beautiful inspiration. I've got a coffered ceiling in our family room and did a blue gray on it. Love the way it makes the room feel. Have a nice weekend. Oooh, I may HAVE to do this to my bedroom! Wow…have been following your blog quite sometime now, but have never commented. These rooms are gorgous!!! I don't have "blue" ceilings, but would consider. Nice Blog. Hi Erin! There isn't any rooms here that I don't like!!! I painted the ceiling in my office blue about five years ago…and all the other walls are different shades of purple…it sounds weird..but it works with white furniture!! Always inspiring coming over here!! Have a great weekend!! I am in absolute adoration of the kitchen in the first picture. I love the ceilings in the light turquoise. 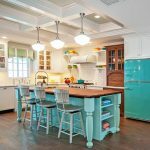 What a great way to bring color to a kitchen in a unique way. I adore painted ceilings. The ceiling in my living room is aqua. The ceiling in my dining room is pink and the ceiling in my breakfast nook is periwinkle….all the walls are painted ivory lily. I most likely will paint the ceilings in the other rooms too when I get to them. I've had these rooms with their painted ceilings for about 5 years. Just lovely. In my current home (I'm renovating a condo to move into as we speak), the walls are painted the same color as the ceiling with crown molding between. It was that way when I moved here, and I like it. Also, I l.o.v.e. your site! I just found it about a week ago, but I've now been through every single back page. Painting the ceiling in turquoise/blue is such a fabulous idea! It casts such a nice cool, elegant glow over the room! I'm SO painting our ceilings after this!! AWESOME post!! My ceilings are half formula Wickham Grey (BM) and I love it! In my girls' rooms, one has a pale pink and the other a pale celery green. Especially fun in a bedroom since you see the ceiling a lot! Isn't home decor fun? I love how all of these images are so different…yet all beautiful and interesting in their own unique ways! Whenever we get around to painting the ceiling in our kitchen/family room it will be a very soft blue. I have wanted to paint it blue for quite a while now. I even mentioned it to my hubby and he seemed ok with the idea. I painted my living room walls a very light turquoise and the ceiling on the front porch the same color to tie the inside and outside together. I recently expanded on the idea and painted the inside of the mudroom door a darker shade on the same chip. I was wondering how to infuse some color into my kitchen. That turquoise ceiling was a great idea. Every pic is so stunning. I love the black floor. Awesome. I can not believe there are so many pictures of blue ceilings! You had me at #2. Absolutely love the blue ceilings! I just saw this on HGTV over the weekend as well. It's so fresh! Great post. 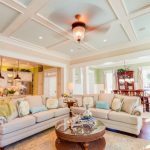 I'm a huge fan of the pale blue ceiling and of your blog! Just fyi, there's a great giveaway on the Ohmigosh! blog this week if anyone likes Stella & Dot jewelry. I think there are 6 or 8 pieces being given away! Hope I win! http://www.ohmigoshblog.blogspot.com is the address. I love the way the blue ceilings add dimension. Very cool. I'm totally in love with that kitchen with the exposed beams from Villa Anna. So charming! Excellent finds, my friend! Wow, that's sick! But it looks so nice! I think my gf would go crazy for this! 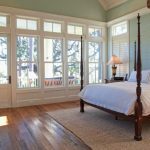 i am about to paint my ceilings and this is a great post before i do it. GORGEOUS collection of photos and I linked this to my ceilings project post too, well done! Yes! We recently moved into an older ranch-style home with 8ft ceilings. We painted them all Palladian Blue by Benjamin Moore and they are so beautiful. I think it gives the illusion of more height and it makes everything look more rich! Love it! while putting in a new ceiling light, i found that the original paint color for my ceiling was blue before a coat of whitewash went on back in the 1800s. i'd say this blue color dated to somewhere around 1830-1850: http://s38.photobucket.com/albums/e118/salemnj1/?action=view&current=IMG_0943.jpg. i'm thinking about restoring the look with benjamin moore's "blue bonnet" 2050-70, which seems fairly close to the chip. This is such a wonderful house interior designs. It is so lovely and very attractive. I love the third and last designs. We just painted our kitchen cabinets white and I definitely want to paint the ceiling blue. I love the visual to confirm it. I truly love how it is simple on my eyes and the data are well written. I am wondering how I might be notified when a new post has been made. I have subscribed to your RSS feed which must do the trick! Have a nice day! “Reputation is what other people know about you. Honor is what you know about yourself.” by Lois McMaster Bujold. Several years ago I read a book by (about?) Martha Stewart. 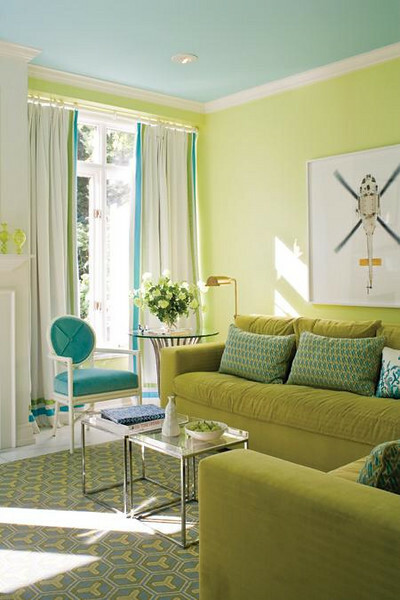 She had a room with blue ceiling, creamy yellow walls and green rug to simulate the outdoors. Anybody know what book it was in. She's written dozens.